In 2015, there were 3,477 people killed and 391,000 injured in crashes involving a distracted driver. Crashes in which at least one driver was identified as being distracted imposed an economic cost of $39.7 billion dollars in 2010. It is clear from an increasing body of safety research, studies and data that the use of electronic devices for telecommunications (such as mobile phones and text messaging), telematics and entertainment can readily distract drivers from the driving task. 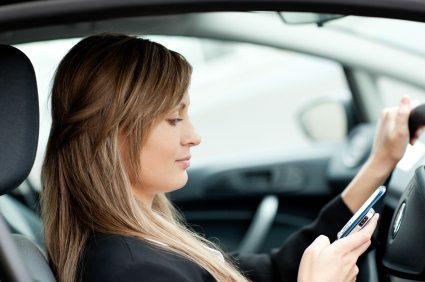 Research has shown that because of the degree of cognitive distraction these devices cause, the behavior of drivers using mobile phones (whether hand-held or hands-free) is equivalent to the behavior of drivers at the threshold of the legal limit for alcohol (0.08 blood alcohol concentration). Crash risk increases dramatically – as much as four times higher – when a driver is using a mobile phone, with no significant safety difference between hand-held and hands-free phones observed in many studies. A 2009 study by the Virginia Tech Transportation Institute found that text messaging increased the risk of a safety-critical driving event by 23.2 times. Ten percent of fatal crashes, eighteen percent of injury crashes, and sixteen percent of all motor vehicle traffic crashes in 2013 were reported as distraction-affected crashes. In 2016 there were nearly two trillion text and multimedia messages sent or received in the U.S.
Nine percent of all drivers 15-19 years old involved in a fatal crash were reported as distracted at the time of the crash. This age group has the largest proportion of drivers involved in fatal crashes who were distracted. Sending or receiving a text message causes the driver’s eyes to be off the road for an average of 4.6 seconds. When driving 55 miles per hour, this is the equivalent of driving the entire length of a football field blind. According to the National Highway Traffic Safety Administration (NHTSA), the percentage of drivers holding cell phones to their ears while driving was just over three percent in 2016. This rate translates into 481,000 vehicles driven by people using hand-held cell phones at a typical daylight moment in 2015. According to the NHTSA, the percentage of drivers visibly manipulating hand-held devices while driving has increased for the fourth year in a row with a total increase of 250 percent between 2009 and 2016. For a full list of citations, please download our Distracted Driving Fact Sheet.